With summers at its peak, the first casualty of the season is always my skin. Just as the summers arrive, my skin starts getting dark and dry, leaving me with no choice but to stick to lightening lotions and brightening balms. 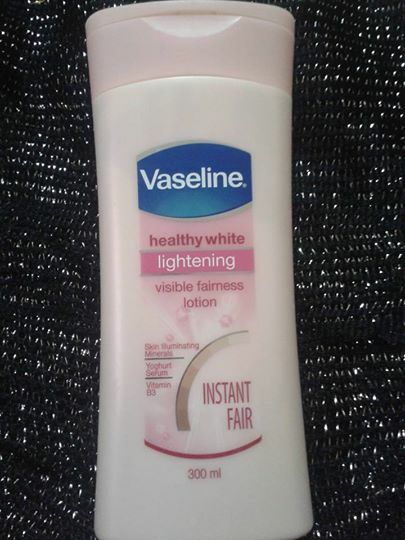 And this time, I’m trying to pamper my parched skin with Vaseline Healthy White Lightening Visible Fairness Lotion. Although, Vaseline Body Lotion is an old favorite, it’s the first time I have got the Healthy White version to lighten my skin tan. Two weeks now and it has already become an essential ingredient of my daily bathing routine. Read the review to discover more about this beauty. Since, pink is my favorite color and I am automatically drawn towards everything pink and pastel, I instantly fell in love with the light pink color packaging of the body lotion. The product contains Skin Illuminating Minerals, Yoghurt Serum and Vitamin B3 to visibly lighten the skin. The product also contains triple sunscreens to prevent further darkening of the skin. Another thing I liked about the lotion is its light watery consistency, which is perfect for summer season. It is slightly pinkish in color with a hint of foundation. Probably it is the slight tinge of foundation that gives the skin an instant bright look. And it is also this hint of foundation that makes this lotion a little difficult to blend. You really have to rub it in to merge the product in your skin. While, the lotion has not lightened or whitened my skin in the real sense, it does provide necessary hydration and visible fairness to the skin. Considering, Vaseline to be a drug store brand, I did not even have much high expectations from the product. Will I Repurchase : No. I will look for some more effective product that actually lightens the skin. Overall, it’s a good product from Vaseline. It is decently priced, attractively packaged and perfectly suits Indian skin in Indian summers. Indian skin has a tendency to look dull and dark in summers. Vaseline Healthy White Lightening lotion not only illuminates the skin instantly but also contains sunscreens to prevent further darkening. But if you are looking to lighten or whiten your complexion with this lightening lotion, you are in for disappointment. I want an old vaseline healthy white. The new packaging with speciality like lightening, instant fair didn’t suit in my face. 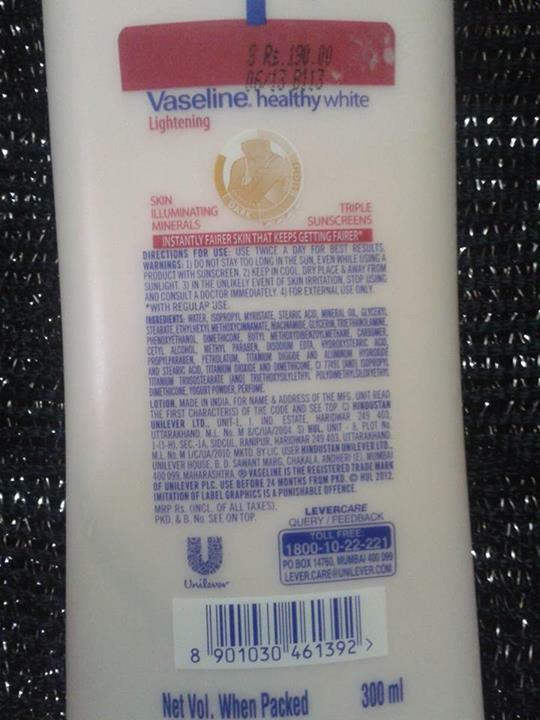 The old vaseline healthy white lotion having triple sunscreen is not available is not available in the market. Now m using attitude sunscreen but I felt that an old vaseline healthy white lotion was better than it. Agree with you Archana. Though it has become such a rarity now!